So last weekend we were visited by our Shihan, Boffa Sensei and he quite rightly took us through some basics again. I always find it really interesting how his teaching makes things so fundamentally clear. It’s like taking everything you think you know, throwing out 80% of it and then boiling it down to one simple detail. I guess this is how you learn things though. You hear a thousand different ideas and inputs and practice those and eventually it leads to one simple idea because you finally understand it. It was during this session on the Saturday that I had a realisation which developed over a week to make me realise that I’ve been doing something fundamentally wrong for the past 4 years. I’m getting that dejavu feeling again. This time it’s something so fundamental and so obvious to everything I can barely belive I hadn’t worked this out before. It is simply to do with my left hand grip. We are all told over and over to grip the Shinai with out little and ring finger, and the index and middle finger should not grip too hard. Okay got that. 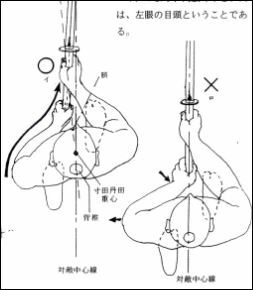 Now the part this weekend that hit a chord was when we were told that having a hole in the palm of you kote was a good indicator of where your grip is wrong as it means you Shinai is moving in your hand in some way and it shouldn’t be. I’ve been doing this for the past 4 years, letting the Shinai move back and fourth in my hand. My kote hole is at the thumb joint. I’ve been allowing the Shinai to move through my hand far too much, using its movement in place of wrist movement. The thing is, I’ve watched people grip the Shinai straight up in a fist and told them not to. I’ve told them to soften the fingers. I’ve also told people to let it move in the hand but that’s not right. So last night I trained all night trying not to do this. The result is I realised how much I was compensating for my lack of grip in the left with too much in the right. I feel like I’ve just started. 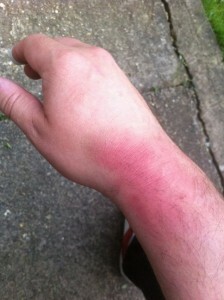 My left wrist and hand ache like never before and I’ve got a blister where I haven’t had one in ages. I’ve got no strength in that hand at all because I’ve not been doing it right. Extra suburi and slower cutting practice are in my future. 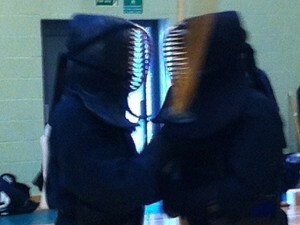 So I’m finally understanding what my seniors say when they said they had to go back and rebuild their kendo. But don’t we all want to do that with all sorts of things. I’m an old programmer at heart and I hear it so offen that if you knew then what you know now, you would have programmed a particular thing completely differently. The thing is you can do this over and over again with kendo with new improved knowledge and experience refining every time. I see no problem with every night taking one aspect of your kendo, forgetting everything you think you know and rebuilding it. Why not? There is no goal. I’m not training to win shiai. I’m not training to beat anyone in the dojo. I’m not even training to get my next grading. Then why? Well I can only speak for myself but I’m training to feel that one perfect moment when every single part of the cut goes perfectly and feels completely effortless. The timing of the push is spot on, the opportunity sticks out like a giant flashing light, the hit is perfect and you zanshin is spot on and you’ve finished the cut before your opponent or you know what has happened. It’s that moment of mushin that everyone talks about. So all I can say is never think that anything you do is perfect. It can always improve or be rebuilt. Survival, hypocrisy, childhood lessons and dead badgers. I try not to watch too much TV but there are a few programs that just will garner my undivided attention. On the flip side of this there are programs I dislike fairly passionately but have become quite popular and also I find myself compelled to watch. Reality shows, which to be honest are anything but, are simply compelling. I’ve always loved to people watch wherever I go. Sat in a street side cafe, watching people go by. One of my favourite places for this was the cafe in The Lovre. Typical. Go to the most well known art gallery in the world and I spend the time people watching. The show I’m fascinated by at the moment is The Island with Bear Grylls. Anything with Bear in it gets my vote. He’ll do anything, eat anything and go anywhere. His wife must panic every time he nips out for a pint of milk. I always have this scenario that plays out in my head of Bear Grylls and Ray Mears going camping together. Bear is off running down mountains, looking for the worst things to eat he can, deliberately doing dangerous stuff just for kicks. Ray is just chilling out, making a shelter out of a tree and brewing tea with some lovely herbal leaves he’s foraged, shaking his head and trying to get Bear to sit still for 5 minutes. This show prompted a debate that I’ve had before. The guys on the island caught and killed a crocodile for food. They’d had nothing but coconut for days and did what any good hunter gatherer would do. Now some of the guys were seemingly a bit emotional about killing this not so defenceless animal. My wife said that people she knows and works with have categorically said that there is no way they could kill an animal for food. This might be an unpopular opinion but if you are not prepared to kill something for food, you shouldn’t be eating meat. That pre packed chicken on the shelf in Sainsburys was alive and it was killed for you to cook and eat. It’s hypocritical to eat meat and not be prepared to kill it for yourself. As a culture we are being removed from the unpleasant things in life. Unless you live on the streets or you live in a country that does not support you, survival is not a big deal. We all have plenty to eat, our water is clean and safe to drink. We have warmth and shelter. If you strip that all away you should still be able to survive. Are you going to just eat nuts and berries, or are you going to hunt, trap and kill an animal too? My wife put it quite simply. Imagine your 4 year old child is cold and hungry, properly hungry to the point of crying about it and growing weak. You’ve given them everything you could even so you will go hungry. Are you going to try and explain to them how you don’t want to kill something to get something to eat? This brings me to my last little mental conundrum that I had the other night. While taking the dog for a walk, we happened across a dead badger in the woods. Not the nicest of things to come across but it was quite fresh and not all injured. The dog wanted it but I was less worried about him than I was my son. This is a point where I could say that it was just sleeping and it will be okay but why? Why sugar coat the truth of life to a 4 year old. I have done so before when the dog has caught a bird and I’ve told him it flew away after I got it off the dog. He went through quite a few ideas on how it would be okay before he understood that it was actually dead. He didn’t cry about it and he didn’t act like he didn’t understand. The funny thing was he started trying to work out what had happened to it. We suggested it got hit by a car and died on its way back to its home. Probably true. He was picking apart possibilities. Detective in the making, I don’t know but it was a good honest lesson. This is the same thing as eating meat. My son is in no doubt about where meat comes from and if he decides he doesn’t want to eat it for that reason then good on him. I do question my own belief in this area too and always tell myself that if I had to, I could kill and gut and animal for food. I’m not saying that I want to but I could if it meant my family didn’t starve. I think that this is a great analogy of how life is now anyway. Our basic needs for survival are all covered so physical evolution is taking more of a back seat. Mental evolution and survival are our key factor these days. There are those of us who are the creators, the ones who go after what they want and try hard. Those who don’t give up and will meet things head on, doing things because they are a challenge and because they are hard and necessary for the survival of what you perceive to be the fittest mentally. So, which do you want to be? Hiki-waza is often a very difficult thing to get your head around. You spend a lot of time learning how to cut going forward but suddenly hiki-waza turns that around, literally, and make you do the same thing backwards. There is that point you reach in jigeko where you cut and go through or you hit taiatare. At this point you can easily be stuck into that mind set of wondering what to do now. Push your opponent back, move to the side, try to get out without being hit. As with all situations in kendo if you run into something that you don’t know what to do, you should concentrate on that thing, ask sensei what to do and develop a game plan. So first the foot work. You are meant to push into you opponent and at the moment they push back, lift your left foot and fumikomi with your right, backwards while striking. Your choice of strike is the next thing to consider. The theory goes something like this. If you push down, your opponents reaction is to push up, thus you strike dou. If you push up you opponent will push down, thus you strike men. If you push straight forward, they will push straight back thus opening kote. This is the theory but executing it is another matter. The important thing is that you actually have a game plan to perform hiki-waza instead of striking randomly. This won’t always work of course. Lastly, don’t hang a round waiting for the right push or pressure. Get in and get out as quick as possible. Choose quickly and don’t give you opponent a chance to think about it because then the instinct kicks in and they will not be able to consciously prevent your cut. Better fumikomi revisited or how to make your toes sting. There is a kendo saying that says as a kendoka you should concentrate and persist at one thing. Just like any good scientist, a good kendoka is always looking for new insights into already established theories and methods and as such this is something I hold on high regard throughout my training. Previously I have focused on my kiai to great effect. It improved dramatically but also made me focus on breathing as a whole and now am finding myself much less out of breath. Recently I’ve revisited my technique of fumikomi as I’ve always felt a little lacking in that area. This came about during a session when we were watching each other perform a cut going through and watching our fumikomi technique. Now mine has always been a little soft in terms of sound but I know that I do not land heel first. Someone very helpfully pointed out that I was lifting my toes at point of impact and was not bending my knee enough. As usual with these small subtle changes, it requires a whole rethink of the technique. As such I am now trying to bend my right knee a little more and now my fumikomi is much louder and feels better, apart from making my toes sting like hell. Apparently this is a good thing. It means I’m actually doing the fumikomi properly and landing more flat footed. More work is required. On a final note, Chris and myself are attending the Level 1 coaching course this weekend, which means I’m learning how to teach people. Initially we went in for this just so we can provide backup if sensei cannot make it one evening, but it’s made be think quite heavily about how to teach people kendo. I’m usually pretty good with the newbies, one on one, offering helpful advice but when it comes to talking to a whole room of people, I get a little tongue tied and nervous. Sensei has been very helpful with tips and methods and I’m quite looking forward to it despite the course being iado and jodo lead. Sod’s law I’ll come back wanting to learn iaido as well.